Her post office ran out of second class stamps a few days ago and they can’t get anymore. All second class, both Christmas and Machin. They have no counter sheets or books and they resorted to cutting up the Business sheets. It’s probably been like this for a week. All local shops including a very big Tescos have none either. Comment was overheard – “We have had our allocation”. Now it may be that PO Supplies at Swindon are not making any more deliveries - although there is still a week to go, and stamps will be needed after Christmas, so holding back makes little sense. There were printings early in the year and again in July and October. Will the next one be in 2017 with a new year code? And will branches with SSKs run out of 2nd class Machin and Hibernating Animals stock and use 1st class rolls in the 2nd class position instead? A sub-postmaster locally told me that he too is cutting up business sheets in the absence of counter sheets of either Machin or Christmas stamps, and the booklet rack is empty. Judging by the MBIL-coded stamps received on Christmas cards (from people who I would expect to use booklets) the problem seems to be widespread. Keep your eyes open - your mail is not just Christmas Cards, it is the stamp on the outside too! We've had no news on further shortages - all areas have new supplies by now, but early-December printings of both 1st and 1st Large counter sheets have now appeared. It really does seem likely that 2017 printings will appear ere long. The 2nd class M17L has duly appeared from a printing of 04/01/17. There was a letter in a paper on Saturday about the lack of festive stamps in Devon and Somerset. The writer also said that out of a dozen or so cards received, only one had the seasonal stamp on. I work as a sorter in Kent and there is no dearth of Xmas stamps here. As there was a printing of English 2nd NVIs a couple of months back with the grey head instead of the silver one, you might expect them to appear, but in the last month I have only seen three, (with silver heads) and (unusually) no Scots or Welsh ones at all. The dark red 1st class Machins are common, as common as the purple ones I would guess. 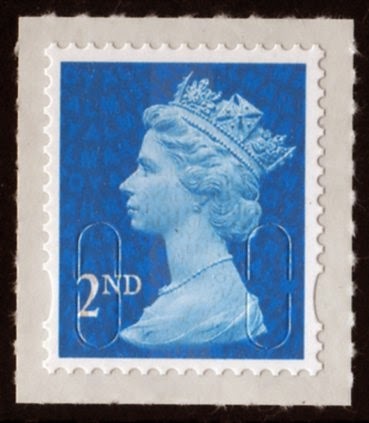 The most common commemorative to be seen on post at present is the twopenny red, followed by the Royal Family photos from the summer. I found the above report from a sorter in Kent very interesting and gives a good insight to what is being used. Maybe this could be a regular blog if 'Anonymous' from Kent would do it. It can hardly come as a surprise to RM that there is an increase in 'traffic' around this time of year and to stock accordingly. Its not as if the surplus wont get used at some point, (well the standard Machins anyway) Surely they know the volume of mail passing through the 'intelligent' sorting machines and can plan accordingly? Interestingly most of our cards have had seasonal stamps on, ironically we live in Devon but most of the cards have come from further afield! I am flattered by Brian M's remarks so here is some more of what is going through the ILSM, here in Kent. I cannot give accurate figures, I am too busy for that but on impressions I would say more than three quarters of the post has Xmas stamps on. 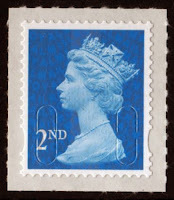 The landscape gardens stamps at £1.33 are popular on foreign letters but I seldom see the NVIs or £1.05s, which is odd.